The Corporate Chalets are located in a designated precinct with premium runway views, the ideal environment to conduct business meetings and provide corporate hospitality. Internally, the standard Corporate Chalet is a self-contained air-conditioned unit with flooring, carpet, lighting and power. Convenient individual entry is from the east with easy access from the main exhibition pavilion. Glass windows and doors lead from inside the chalet onto a fully fenced courtyard area with carpeted flooring and a flagpole. 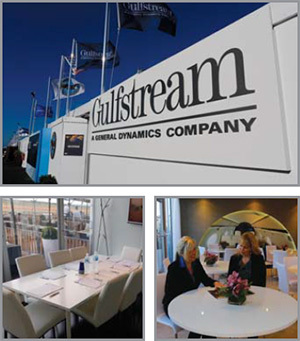 Catering, furnishing and any external fit out is at the discretion of the exhibitor and an additional cost. The internal area of each single chalet is 50sqm (10m x 5m) and the external area of each single chalet is also 50sqm (10m x 5m). 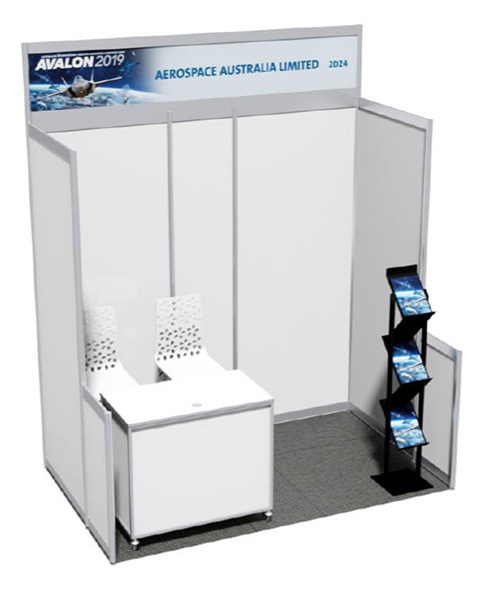 Custom stands allow the exhibitor to design and build their stand to their own specifications. 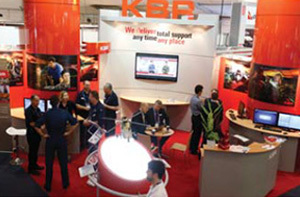 Flooring, lighting and electrical installations are the responsibility of the exhibitor. Raw space (bare flooring) only is provided. 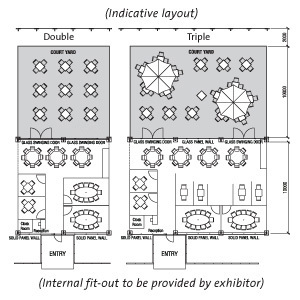 Stand designs must be approved by the Organiser prior to the event. 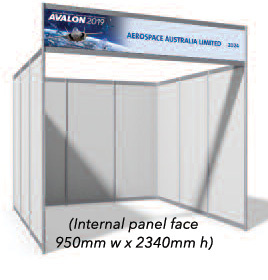 This option provides the exhibitor with a ready-built 9sqm (3m x 3m) shell scheme unit. It includes partitioned side and back melamine walls 2.5m high, fascia board with the company name facing the aisle, two spotlights, one 10amp power point and carpet. Furnishing of these stands is at the exhibitor’s expense. Outdoor space for free-standing exhibits. Exhibits may be located on grass, tarmac or a combination (as available). Power (by generator) may be available at additional cost. 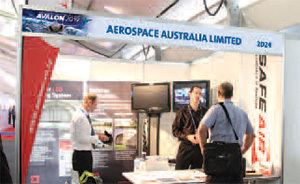 External aircraft static display space is available for the presentation of aircraft on static display at the Australian International Air Show. Charges are based on aircraft empty weight. 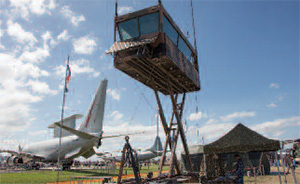 Depending on site conditions, aircraft static displays may, at the discretion of the Organiser, be supplemented by external exhibition structures at an additional cost. Exhibitor-supplied-structures are not permitted except with the prior consent of the Organiser. Located within the General Aviation precinct, display gazebos are free standing structures sold in conjunction with static displays. Each gazebo is a 3m x 3m = 9sqm tented structure with carpet finished flooring, including 1 x 10 amp power point. Solid walled, roof, vinyl floored unit with internal dimension of 5.8m x 2.2m. The Display Unit comprises a 5m x 5m solid cassette walled tent with white PVC roofing and timber flooring. These units have no fit out included and design/installation/dismantle is at the discretion of the exhibitor, at their expense and subject to the approval of the organisers. Each Display Studio comprises a 10m x 5m solid cassette walled tent (on 3.2m leg height) with white PVC roofing and timber flooring. Exhibition space sells fast and is allocated on a first come first served basis. or via telephone +61 (0)3 5282 0500.